If there's one guy music-loving Cosmo chicks should thank for bringing the reggae revolution to the masses, it's Jamaican singer-songwriter Bob Marley. Even after 31 years since his passing, his legacy of laidback, soulful rhythms still strongly lives on in the worldwide reggae scene. Through his son Rohan Marley, the 6th among his 11 children, Bob's messages of love, hope, unity, and peace through music find their way to a new collection of headphones, portable sound systems, and lifestyle gear. 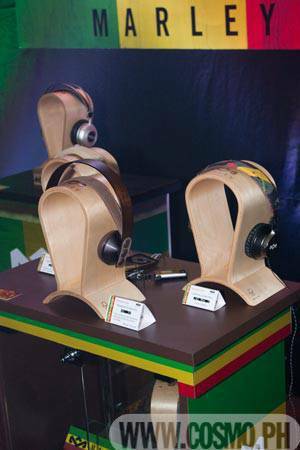 The House Of Marley, a collection of premium, earth-friendly--not to mention super-cool--personal audio products created by the reggae legend's son, has finally made its way to Manila. To launch the arrival of the collection in Manila, a reggae-themed party was held at Prive Luxury Club, where we also spotted host Karen Pamintuan and her main man--and Cosmo Centerfold hall of famer!--Brent Javier. Reggae fans slapped on their beanies, swayed to the steady beats, and partied like true Rastas! The youthful style and reggae connection aren't the only things that make these products a prized find--everything from The House of Marley is created with a focus on using sustainable products, in addition to providing exceptional sound. The epicenter of a global movement, 1Love.org is a movement sparked by the Marley family dedicated to spreading the elder Marley's message by lifting up a new generation of "young gongs" to wave the banner for charities, causes, and ideas that can change the world. The House of Marley donates five percent of its annual profits to the 1Love.org, so when you buy yourself some Marley gear, you're actually helping give back to the community. How's that for an added perk?